Beta particles can interact with electrons as well as nuclei in the medium through which they are travelling. Beta particles passing near nucleus will be deflected by the coulomb forces and losses of the beta particles kinetic energy may or may not (Rutherford scattering) occur. 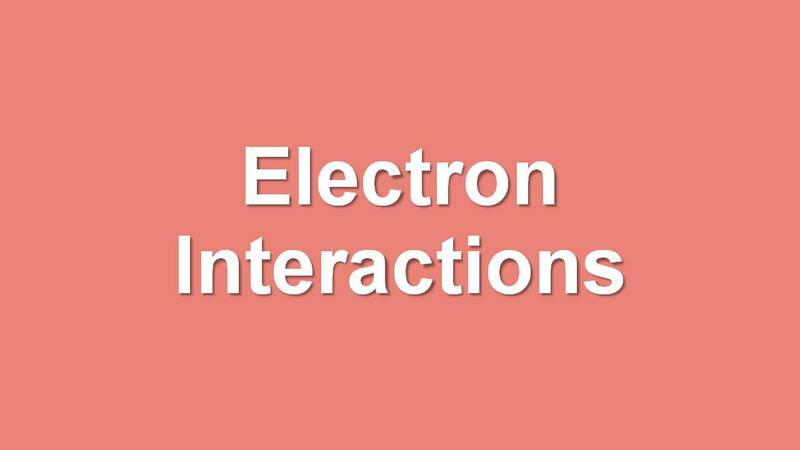 The interactions of beta particles with orbital electrons are most important. Coulomb repulsion between beta particles and electrons frequently results in ionization. 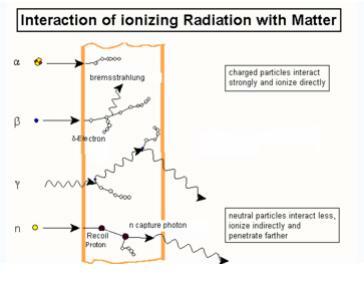 In the ionization process, the beta particles lose an amount of energy equal to the kinetic energy of the electron plus the energy used to free it from the atom. A beta particle may produce 50 to 150 ion pairs per centimeter of air before its kinetic energy is completely dissipated. 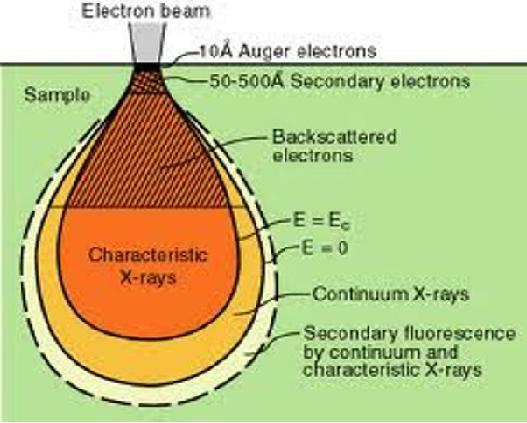 The characteristic X-rays are emitted, when the vacant internal electron orbits are refilled with other electrons. Beta particles also cause excitation of external orbital electrons, which in turn leads to the emission of ultraviolet photons. The ultimate fate of a beta particle depends upon its charge. A negatively charged beta particle, after its kinetic energy has been spent, either combines with a positively charged ion, or becomes a "free electron". Positrons, however, have a different fate. In spite of the fact that they dissipate their kinetic energy just like beta particles through ionization and excitation, they cannot exist at rest in the vicinity of the electrons. 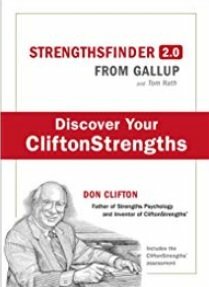 When a positron has been slowed sufficiently, it will be attracted to the opposite charge of an electron. When the electron and positron collide, they are both annihilated and an amount of energy equal to the sum of the particle masses is released in the form of two photons. These photons are referred to as "annihilation radiation". Both annihilation photons carry energy of 0.512 MeV, which is equivalent to the rest mass of the electron or the positron. Because of this phenomenon, 0.512 MeV photons often provide a convenient means for measurement of positron-emitting radionuclides. Like alpha particles, betas have a characteristic average traveling distance (range) through matter that is dependent upon their initial kinetic energy. Beta particle range may be expressed as distance traveled in a certain medium. For example, beta particle with energy about 2 MeV will travel up to 9 m in air and about 10 mm in water. Beta particles can interact with electrons as well as nuclei in the medium through which they are traveling.Beta particles passing near nucleus will be deflected by the coulomb forces and losses of the beta particles kinetic energy may or may not (Rutherford scattering) occur. Figure shows the electron interaction with matter. Like alpha particles, betas have a characteristic average traveling distance (range) through matter that is dependent upon their initial kinetic energy. Beta particle range may be expressed as distance traveled in a certain medium.For example, beta particle with energy about 2 MeV will travel up to 9 m in air and about 10 mm in water.